I don't like going too long without working on a print, but I feel like it's been a long time since I got any artwork done. Art related- there's been a ton of that. College classes, workshops, exhibitions- I've kept pretty busy. But not much art getting done. Maybe it's the effect of this Intro class they've had me teach the past few semesters; the most anti-art art class I've ever seen, but that is the way the university seems to want it. The students who did see my work in the recent Faculty show seemed to really like it, but that started coming down this week. The work in Ocean Grove also got some good reactions- that has a few more weeks. Work is progressing on a print show I am providing guidance for. A studio visit that happened last month was very much appreciated by those who came. And I got word today that my next workshop in Belmar is officially on the schedule. So maybe it's time to start acting like an artist again. Ever since I decided to concentrate on printmaking, I have never had a lack of ideas for artworks. I have a couple of blocks going already, but I had another one I wanted to get going on, an idea that's been kicking around for a few years. 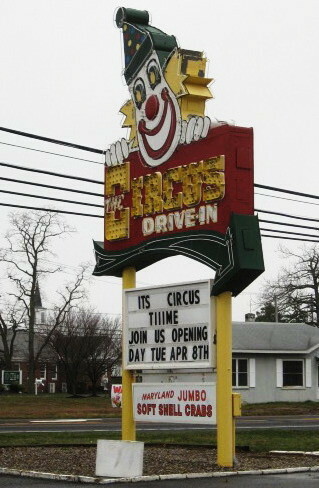 Anyone who knows this area is familiar with the Circus Drive-In. It's practically in my DNA. It was built in the 1950's, which meant that my father worked there in his high school years. It eventually became a landmark. It was a pretty standard drive-in type restaurant, open for lunch and dinner, with a mix of burgers, sandwiches, and other typical road side dining fare. The original shape was round (like a circus big top tent), but later wings were added to both sides, seating for parties, and more spaces for cars to park and order. A few things set it apart. One was the inclusion of soft shelled crabs on the menu- common enough in seafood restaurants, but you won't find then at most drive-ins. The second was the theme. Every item was named after an animal or a typical circus/sideshow attraction. However, circuses aren't as popular as they once were. Several years ago the largest of them all, the Ringling Brothers/Barnum & Bailey circus, closed for good. The original owners ran the place for almost 50 years, then retired, and it was operated for a few years by different people, but the drive-in closed for the season a few years ago and never reopened. The building remained in place for another year, but now it is torn down, with only the big sign (above) left to mark where it was. A lot of what once existed in this area is now gone, the land worth more than the value of the businesses that were on them, so the businesses were closed and the land was sold. Running a business is a long term commitment, while selling property is quick and profitable. But, as my old professor used to say, art is forever. The title of this post is a working title for this potential series of artworks about regional businesses that have closed and been demolished, never to be seen again. It is adapted from a song lyric by the band Bad Brains, from their debut album (circa 1982), regarding the band's being driven out of its hometown years earlier. Many businesses that were once big are now gone. I dealt with a few of them in my boardwalk series. 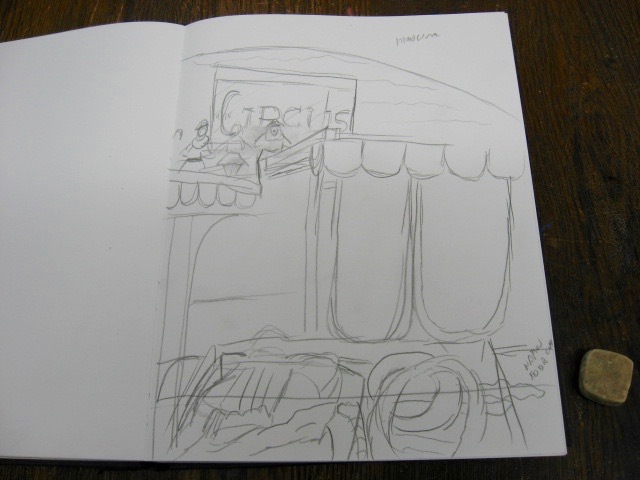 This possible new series begins with the Circus. My starting point was two photos that document things that no longer exist, one showing the last fried soft shell crab sandwich platter (with fries and onion rings) I ever had there, and a view of the building itself, one of a few I took after it closed but before it was torn down. The idea is to show it as food on a car hop tray, hanging outside a car window, as a customer might have ordered it. I've been seeing these images for years, thumbnail icons on my desktop every time I turn on my computer, and I've even tried sketching it out a few times, but turning those tiny images into a block sketch was a challenge. So today I bit the bullet and printed out full page copies of the two most significant images and brought them with me to the Studio. The above sketch is the idea I am going with. Still have to work out all the mirror reversal stuff, and I'm not worried about exactly copying anything from the photos, but at least I have a plan now. When I get it all figured out, I can start working on a block drawing.